Every summer we vacation up at the cottage in a little northern town called Thornbury. It is a sleepy little town but has some great pubs and spectacular coffee shops. Last summer I tried a Rosemary Shortbread cookie from our favourite coffee shop and was blown away as to how lovely it was. This spring has been particularly wet with more rainy days than dry so my garden is growing wild and fast. Luckily I was a little more conservative this year planting just a few tomato, pepper and zucchini plants. I am sure if I had planted more it would have completely taken over half my backyard. Since I had a little more room than normal I decided to plant some herbs such as Basil, English Thyme, Oregano, Chives and Rosemary. 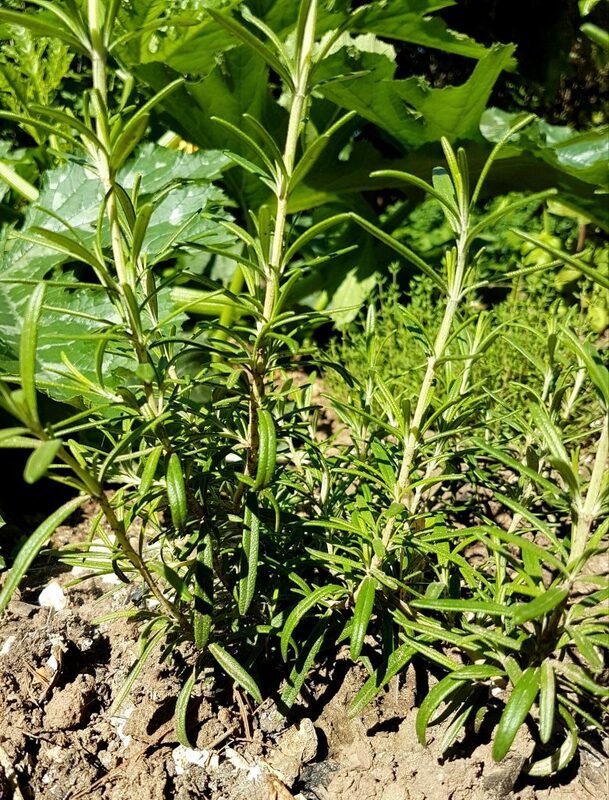 Not only is it lovely to have fresh herbs for baking and cooking but it also takes up more room in my garden and comes back year after year. This means less time next season planting annuals and enjoying more time doing other things. I recently found a recipe for this cookie and thought I would make a lower carb version. The result was a savory easy to make treat. I used unblanched almond flour so the cookies are darker than a traditional shortbread. If you want that lighter cookie make sure you get the blanched almond flour. It is also important the the cookie are as uniformed as possible. Once the dough has been in the fridge I would suggest actually using a ruler and lightly score the top of the roll in 1/4 inch intervals then go back and slice the dough. This way you won’t have some that are burnt or under cooked. I also have a few spectacular lavender plants that I thought I lost over winter but again with all the rain they have come back with a vengeance. 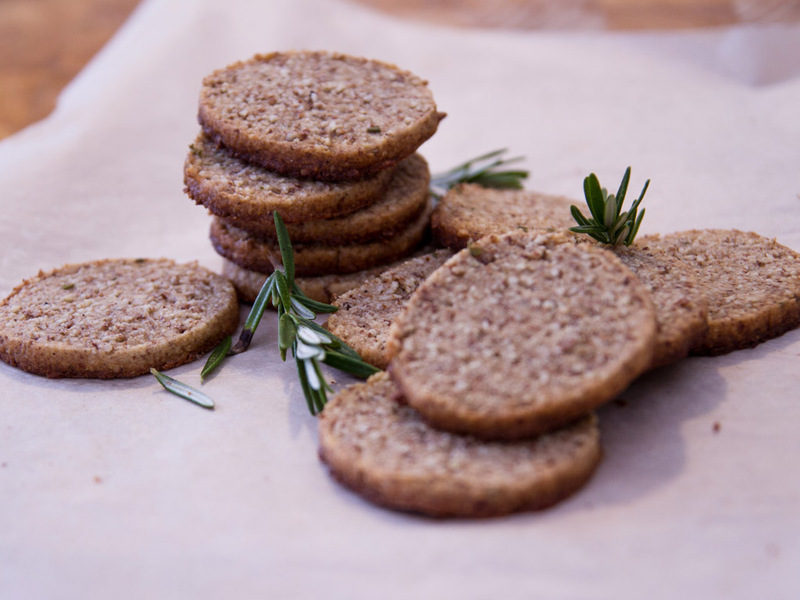 I think I will make these cheeky little cookies again over the summer and use the lavender instead of the rosemary. The beauty of baking is you really can customize the baked good to your own liking when adding flavour. As long as the base is the same the flavours you can add is endless. In a large bowl using a hand mixer, mix together the butter and agave nectar. Add Rosemary, almond flour, sea salt and blend until incorporated but do not over mix. Shape into an 8 inch (20 cm) roll and wrap in plastic wrap and refrigerate for an hour. If you wish to make shortbread at a later date, dough can be frozen at this point. After thoroughly refrigerated, preheat oven to 300 F .
Remove the dough from the plastic wrap and cut into 1/4 inch slices using a large sharp knife. Place on parchment lined baking sheets, at least an inch apart. Bake for 15 min or until the edges start to turn light brown. When cool, remove from cookie sheet and store in an airtight container.